Aim: We aimed to evaluate the efficacy and safety of apatinib treatment and its impact on the quality of life (QOL) of patients with advanced gastric cancer (GC) who experienced failure with at least two chemotherapeutic regimens. Materials and Methods: All patients received apatinib at a daily dose of 500 mg for 4 weeks per cycle until it was stopped due to disease progression, intolerable toxicity. Response Evaluation Criteria in Solid Tumors version 1.1 and Common Terminology Criteria for Adverse events 4.0 were used to assess tumor responses and toxicities, respectively. The European Organization for Research and Treatment of Cancer QLQ-C30 and QLQ-STO22 were used to assess the impact on patient's QOL. Results: Twenty-five patients were enrolled, but only 24 were evaluated for therapeutic effects. After apatinib treatment, none of the patients achieved complete response (CR), one achieved partial response (PR), and eight had stable disease (SD), resulting in a disease control rate of 37.5% (CR + PR + SD). Responses to questions regarding abdominal pain, nausea/vomiting, insomnia, constipation, and diarrhea in QLQ-C30 and abdominal pain and reflux in QLQ-STO22 were changed over the course of treatment (P < 0.05). The QOL score was elevated after three treatment cycles, but it was not considered statistically significant (P > 0.05). Conclusion: Results indicated that apatinib was effective in heavily pretreated patients with advanced GC who experienced failure with two or more line chemotherapies. The toxicities were tolerable or could be clinically controlled. Apatinib treatment alleviated some of the clinical symptoms but did not improve QOL significantly. Gastric cancer (GC), including gastroesophageal junction (GEJ) adenocarcinoma, is a common gastrointestinal neoplasm, which is the fifth most common cancer and the third leading cause of cancer-related deaths worldwide. Surgery is the most effective and the only curative treatment for early diseases; however, early diagnosis is difficult, and the majority of patients have advanced to late-stage disease at the time of diagnosis because most patients are asymptomatic in the early stage. Patients with advanced or metastatic GC can barely receive a survival benefit from surgery. Chemotherapy and radiotherapy used as single or combined modality have shown only a marginal survival advantage. Therefore, the importance of molecular targeted therapy became clear over the recent years. Many target drugs against advanced GC are emerging from clinical trials, including antiangiogenic agents. Angiogenesis is one of the most important mechanisms for the formation and progression of solid malignant tumors. The vascular endothelial growth factors (VEGFs) and their VEGF receptors (VEGFRs) are of substantial importance in normal angiogenesis, and they are also key mediators in the induction of tumor angiogenesis. The expression levels of VEGFs and VEGFRs are higher in GC tissues and are associated with poor prognosis of GCs. Several anti-VEGFR antibodies and VEGFR inhibitors exhibited positive clinical effects in the treatment of GCs via possible mechanisms of decreasing tumor blood flow and nutrient supply and increasing drug penetration into the tumor. Apatinib is a newly developed small-molecule tyrosine kinase inhibitor with antiangiogenic activity. It selectively binds to and inhibits VEGFR-2, which is a tyrosine kinase receptor present in endothelial cells of both lymphatic and blood vessels. The Phase II and III clinical trials conducted in China have proven its efficacy in patients with advanced or metastatic gastric carcinoma and other cancers when compared with placebo,,,,,, and it has been approved for the third-line treatment of gastric adenocarcinoma and GEJ by the Food and Drug Administration in China. Therefore, we carried out an observational study to obtain more clinical evidence of its efficacy for treating patients with chemotherapy-refractory advanced GC. Moreover, we focused on assessing its safety as well as the impact on quality of life (QOL) in patients with terminal GC. (1) Patients with advanced gastric adenocarcinoma or GEJ adenocarcinoma diagnosed by histology or cytology in the Oncology Department of the Second Affiliated Hospital of Anhui Medical University from June 2015 to October 2017, (2) patients who had progressed or relapsed after undergoing standard second-line chemotherapy or beyond, (3) patients with IV stage cancer with at least one measurable lesion, (4) patients aged over 18 years, (5) patients with the Eastern Cooperative Oncology Group score of 0–2 points and the survival time of more than 3 months, (6) patients with no serious liver and kidney damage (blood urea nitrogen ≤1.25 × [upper normal limit (UNL)], creatinine ≤1.25 × UNL, total bilirubin ≤1.5 × UNL, glutamic pyruvic transaminase and glutamic oxaloacetic transaminase ≤ 5 × UNL), and (7) patients who signed an informed consent form were included in the study. By contrast, (1) patients whose surgical incision has not yet healed or who developed local lesions after radiotherapy, interventional chemotherapy; (2) patients who developed complications such as intestinal obstruction, ileac passion, gastrointestinal perforation, enterocolic fistula, and abdomen syrinx; (3) patients who have abnormal blood coagulation function (international normalized ratio >1.5 or prothrombin time > UNL + 4 s) or have evident gastrointestinal hemorrhage; (4) patients with medication-resistant hypertension or abnormal urine protein (r++ or 24-h urine protein quantity >1.0 g); (5) patients who cannot take oral medications; (6) patients with heart, liver, kidney, and lung failure; and (7) pregnant or lactating women or mentally ill patients were excluded. All patients enrolled in this study have been treated with apatinib (Aitan, Jiangsu Hengrui Medicine Co., Ltd. National Medicine Standard No. H20140105) at an initial dose of 500 mg daily 30 min after every meal. The treatment cycle was repeated every 4 weeks, but the daily dosage was reduced to 250 mg when patients experienced severe adverse events (AEs) or was discontinued on patient's request. The efficacy of apatinib treatment was evaluated according to the Response Evaluation Criteria in Solid Tumors version 1.1 (EORTC/NCI RECIST v-1.1, MD, USA), including complete response (CR), partial response (PR), stable disease (SD), progressive disease (PD), objective response (Relative Risk = CR + PR), and disease control rate (DCR = CR + PR + SD). These therapeutic responses were evaluated by computed tomography (CT) and physical examination after every 4-week medication cycle until disease progression. Reporting of the time of progression-free survival (PFS) and overall survival (OS) were also included in the evaluation of apatinib efficacy. The European Organization for Research and Treatment of Cancer QOL Questionnaire-Cancer (QLQ-C30) and the site-specific module for GC (QLQ-STO22) were used to measure patients' QOL in this study. Statistical analysis of the original data was performed using SPSS 16.0 software (SPSS Inc., Chicago, IL, USA), and t-test was used for counting. P < 0.05 was considered statistically significant. A total of 25 patients with advanced gastric adenocarcinoma or GEJ adenocarcinoma admitted in the Cancer Center of the Second Affiliated Hospital of Anhui Medical University between July 2015 and October 2017 were enrolled in this study. Of them, 16 were men and 9 were women. The average age of patients was 63.56 ± 9.99 years (range: 48–81 years). Auxiliary radiotherapy and chemotherapy after surgical treatment from the initial diagnosis were regarded as first-line treatment [Table 1] and [Table 2]. Among 25 patients, the medication treatment in one patient was discontinued due to the presence of Grade 4 albuminuria and absence of improvement during treatment. Hence, only 24 patients were evaluated. 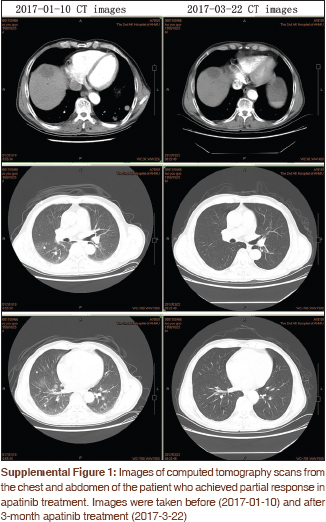 None of the patients achieved CR while PR was observed in one patient whose CT scans are shown in [Supplemental Figure 1]. The percentage of PR, SD, PD, objective response (CR + PR), and disease control ratio (CR + PR + SD) reached 4.2% (1/24), 33.3% (8/24), 62.5% (15/24), 4.2%, and 37.5%, respectively. The median time of PFS was 3.75 and that of OS was 4.90 months as shown in [Figure 1]. The AEs that patients have experienced in varying degrees were evaluated: hypertension, albuminuria, hand-foot syndrome, elevated thyroid-stimulating hormone, diarrhea, and thrombocytopenia. The assessment results are shown in [Table 3]. 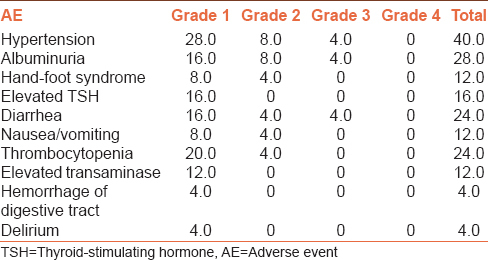 In this study, all patients experienced Grade 1 or 2 AEs, but only three had Grade 3 AEs. One patient had Grade 3 hypertension, and another had diarrhea. The vital parameters of those who developed severe AEs returned to normal after decreasing the dosage of the medication. However, the Grade 3 albuminuria in one patient did not improve after medication withdrawal and symptomatic treatment. The rate of questionnaire completion was 100%. [Table 4] lists the QLQ-C30 and QLQ-STO22 scores of enrolled patients over the course of apatinib treatment. 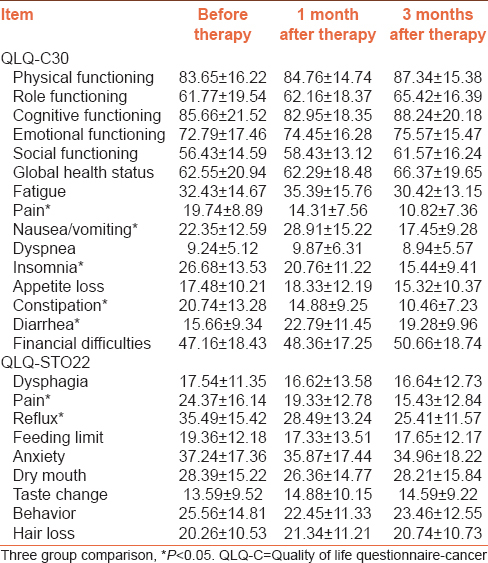 In the QLQ-C30 table, pain, nausea and vomiting, insomnia, constipation, and diarrhea were significantly different before and after treatment (P < 0.05). In the QLQ-STO22 table, pain and reflux were statistically significant before and after therapy (P < 0.05). Patients with advanced GC hardly benefit from third or more line chemotherapy; however, some of them can tolerate other modalities that can help improve QOL or extend their lives. Therefore, anti-angiogenesis drugs used in targeted therapies have become attractive in current research, most of which were developed to target VEGF pathways and were comprised of anti-VEGF monoclonal antibodies, tyrosine kinase inhibitors, and VEGF receptor monoclonal antibodies. Ramucirumab, a monoclonal antibody of VEGFR-2, has shown to improve overall response rate and PFS in the management of advanced GC. Apatinib, a new generation of small-molecule tyrosine kinase inhibitor of VEGFR-2 recently developed in China, can competitively bind to the ATP-binding site in this receptor, thus inhibiting its tyrosine kinase activity and blocking its signal conductivity., Limited real-world research has proved clinical efficacy and safety of apatinib, but its impact on patients' QOL has not been characterized yet. In Phase II clinical trial Li et al. observed the efficacy of apatinib treatment at a dose of 850 mg daily or 425 mg twice daily in 144 patients with either advance GC or GEJ adenocarcinoma who had failure on second-line chemotherapy or beyond, and reported an objective response rate of 6.38%, with median OS and PFS of 4.83 months and 3.67 months, respectively. In another clinical trial in 60 GC patients, who were given apatinib at a dose of 750–850 mg daily as third-line treatment, the objective response rate and disease control rate were reported to be 3.33% (2/60) and 38.33% (23/60), respectively, which also had significant advantages compared with placebo. Our department has been treating advanced GC patients with apatinib since 2015. As recommended, the patient was given a daily dose of 750 mg. However, we found that patients who received this dosage tend to experience severe adverse reactions including Grade 3 hypertension and albuminuria. Although the recommended daily dose of apatinib is 850 mg, a lower dosage was also suggested to be tested at the beginning of treatment for safety purposes. Hence, the patients were given a daily dose of 500 mg. After treatment, a reduction in the severity of adverse reactions and an improvement in patient compliance were noted. The outcomes of our study were similar to the data of those two trials with objective response rate and disease control rate of 4.2% and 37.5%, respectively. All patients in this study were followed up until February 1, 2018, and the median OS and PFS were 4.90 months and 3.75 months, respectively, showing no significant difference with those trials using a dosage of 850 mg. The slight difference with a little lower effectiveness in our study may reflect the differences in drug dosage, the number of patients and individual statuses. Overall, the approval of apatinib in the treatment of patients with advanced GC was largely based on its effect on extending OS and PFS; thus, our study further confirmed its feasibility to improve the survival benefits in the treatment of patients with advanced GC or GEJ adenocarcinoma. Similar to other anti-angiogenesis drugs, apatinib has some adverse reactions. The main apatinib-related AEs reported in this study included hypertension (40%) and albuminuria (28%). The incidence of hypertension in our patients was similar to those given high-dose apatinib (850 mg) treatment, but the incidence of albuminuria, hand-foot syndrome, arrest of bone marrow, and diarrhea was obviously lower (28% vs. 44% in albuminuria; 12% vs. 27.35% in hand-foot syndrome). This finding indicates that these AEs were dose related. Most adverse reactions reported in this study were Grade 1 or 2 and were tolerable or well-managed without the need for suspension of medication. Moreover, the symptoms were gradually alleviated and disappeared within 1 or 2 weeks. However, there were two patients who developed serious AEs. One patient experienced grade 3 hypertension (162/98 mmHg), which was controlled well with irbesartan treatment. Another patient had Grade 3 albuminuria without any sign and symptom of kidney failure, but albuminuria did not improve much in urine test at the end of 3 months' follow-up after apatinib withdrawal. The reason why anti-VEGFR medication caused albuminuria remained unclear; the increased permeability of glomeruli filtration membrane may represent a possible explanation. Elevated thyroid-stimulating hormone (TSH) is one of the most common AEs when taking anti-VEGFR medications. However, patients with elevated TSH Grade 1 or 2 do not usually require thyroid hormone supplementation. The frequency of elevated TSH in this study was 16% (4/25). All study participants had elevated TSH Grade 1, but the TSH levels of two patients returned to normal without receiving any treatments. Other adverse effects of apatinib, such as hand-foot syndrome, diarrhea, nausea and vomiting, and liver and kidney damage were similar to those of anti-VEGFR medications. Overall, the adverse effects of apatinib were considered moderate and acceptable, and apatinib had a favorable safety profile. To evaluate patients' QOL, the QLQ-C30 and QLQ-STO22 questionnaires were used. Apatinib administration resulted in the lower scores of abdominal pain and reflux, indicating its role in the improvement of these symptoms. The scores of nausea and vomiting were higher within 1 month of treatment but were lower after three cycles of treatment; hence, the earlier symptoms were considered as treatment-related AEs. However, these adverse reactions were tolerated because they were alleviated or disappeared during treatment. In contrast to constipation, which was significantly improved, diarrhea (with a 24% frequency) in this study tended to be scored higher during treatment, which could represent another AE of apatinib treatment. The score of insomnia decreased gradually, which was similar to the results reported in Li et al. 's study. In the General Analysis Form, some domains such as physical, role, cognition, emotional, and social function gained higher scores after therapy, but the changes were not statistically significant (P > 0.05). Our results demonstrated that apatinib treatment alleviated the clinical symptoms but did not improve patients' QOL significantly. The results in this study further supported that the treatment with apatinib in patients with advanced GC or GEJ adenocarcinoma extended the OS and PFS and that the adverse reactions were considered moderate and tolerable. Although patient's QOL was not improved much, some symptoms including abdominal pain, acid reflux, and insomnia were alleviated. Therefore, we conclude that apatinib is effective in the treatment of patients with chemotherapy-refractory advanced GC. We acknowlege the support of a grant from the Second Affiliated Hospital of Anhui Medical University, China. This study was supported by a grant from the Second Affiliated Hospital of Anhui Medical University, China. Chaoxu Z, Rongshou Z, Siwei Z. An analysis of incidence and mortality of stomach cancer in China, 2010. China Cancer 2014;23:795-800. Reddavid R, Sofia S, Chiaro P, Colli F, Trapani R, Esposito L, et al. Neoadjuvant chemotherapy for gastric cancer. Is it a must or a fake? World J Gastroenterol 2018;24:274-89. Roviello G, Polom K, Roviello F, Marrelli D, Multari AG, Paganini G, et al. Targeting VEGFR-2 in metastatic gastric cancer: Results from a literature-based meta-analysis. Cancer Invest 2017;35:187-94. Samson P, Lockhart AC. Biologic therapy in esophageal and gastric malignancies: Current therapies and future directions. J Gastrointest Oncol 2017;8:418-29. Mi YJ, Liang YJ, Huang HB, Zhao HY, Wu CP, Wang F, et al. Apatinib (YN968D1) reverses multidrug resistance by inhibiting the efflux function of multiple ATP-binding cassette transporters. Cancer Res 2010;70:7981-91. Scott AJ, Messersmith WA, Jimeno A. Apatinib: A promising oral antiangiogenic agent in the treatment of multiple solid tumors. Drugs Today (Barc) 2015;51:223-9. Shukui Q, Jin L. The expert conclusion of clinical therapy from apatinib on gastric cancer. Chin Clin Oncol 2015;20:841-7. Chen J, Wang J. Efficacy and safety assessment of apatinib in patients with advanced gastric cancer: A meta-analysis. Onco Targets Ther 2018;11:4149-58. Zhao D, Hou H, Zhang X. Progress in the treatment of solid tumors with apatinib: A systematic review. Onco Targets Ther 2018;11:4137-47. Ni Y, Ye X. Angiogenesis and apatinib: Can be used for the patients with non-gastic cancer? J Cancer Res Ther 2018;14:727-9. Yang C, Feng W, Wu D. Efficacy and safety of apatinib in patients with previously treated metastatic colorectal cancer: A real-world retrospective study. J Cancer Res Ther 2018;14:159-62. Eisenhauer EA, Therasse P, Bogaerts J, Schwartz LH, Sargent D, Ford R, et al. New response evaluation criteria in solid tumours: Revised RECIST guideline (version 1.1). Eur J Cancer 2009;45:228-47. Rausei S, Mangano A, Galli F, Rovera F, Boni L, Dionigi G, et al. 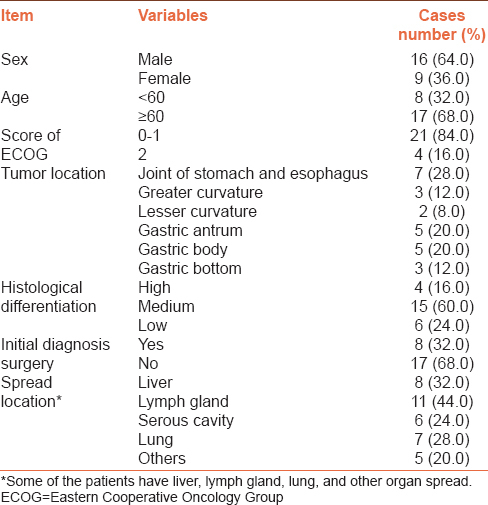 Quality of life after gastrectomy for cancer evaluated via the EORTC QLQ-C30 and QLQ-STO22 questionnaires: Surgical considerations from the analysis of 103 patients. Int J Surg 2013;11 Suppl 1:S104-9. Cirillo M, Venturini M, Ciccarelli L, Coati F, Bortolami O, Verlato G, et al. Clinician versus nurse symptom reporting using the national cancer institute-common terminology criteria for adverse events during chemotherapy: Results of a comparison based on patient's self-reported questionnaire. Ann Oncol 2009;20:1929-35. Mclellan B, Kerr H. Cutaneous toxicities of the multikinase inhibitors sorafenib and sunitinib. J Dermatol Ther 2011;24:396-400. Qin SK. Phase III study of apatinib in advanced gastric cancer: A randomized, double-blind, placebo-controlled trial. J Clin Oncol 2014;32 Suppl 15:a4003. Li J, Qin S, Xu J, Guo W, Xiong J, Bai Y, et al. Apatinib for chemotherapy-refractory advanced metastatic gastric cancer: Results from a randomized, placebo-controlled, parallel-arm, phase II trial. J Clin Oncol 2013;31:3219-25. Bo W, Lijie S, Pengyun N. Clinical efficacy of apatinib in treatment of advanced gastric cancer. World Chin J Digestol 2016;24:759-64. Eremina V, Baelde HJ, Quaggin SE. Role of the VEGF – A signaling pathway in the glomerulus: Evidence for crosstalk between components of the glomerular filtration barrier. Nephron Physiol 2007;106:p32-7. Cohen RB, Oudard S. Antiangiogenic therapy for advanced renal cell carcinoma: Management of treatment-related toxicities. Invest New Drugs 2012;30:2066-79. Qiong M, Jiahong L, Chonghua W. Development and evaluation on Chinese version of measurement instrument of quality of life for patients with stomach cancer: EORTC LQQ-STO22. J Kunming Med Univ 2012;10:34-8.